A former undercover police officer has applied [pdf] for anonymity in the Undercover Policing Inquiry. The officer concerned infiltrated a Maoist faction of the Women’s Liberation Front in the 1970s. Although written in 2017, the statement has only recently been publicised. And the reasons given for claiming anonymity are already a contender for the most ridiculous thing you’ll read in 2018. The inquiry was set up in 2015 to investigate police infiltration of protest groups. Since 1968, the police have spied on at least 1,000 groups using at least 144 undercover officers. Undercover officers have formed sexual and intimate relationships with those they targeted, given evidence under false names, committed criminal acts, and stolen the identities of children who died when they were young. 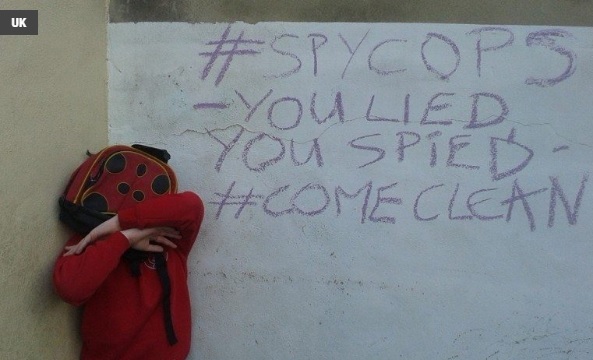 The police have frustrated the targets of police spying every step of the way – refusing to confirm or deny whether a person is an undercover officer even when there is overwhelming proof. And the inquiry has been bogged down in anonymity applications since it began. I would be embarrassed about her finding out about me being an undercover officer. it makes my heart sink to think about my colleagues… knowing about my work… they would probably find it unbelievable that I was involved in this work as they don’t even know that I was a police officer. She further cites a threat [pdf] from “anti-police groups” that even the police’s risk assessment didn’t conclude was a problem. And then cites an “intrusive media” as another reason for her concerns. Whilst I think my close friends would understand, I am worried that my reputation amongst my wider group of associates would be tainted. HN348 appears to forget that the real victims are the people who’ve had their lives and privacy intruded on by undercover police officers. She may never have thought that a year’s deployment in the 70s would be something she’d ever have to talk about. But ’embarrassment’ is not a good enough reason to claim anonymity. Unless the names of undercover police officers are released, the victims of police spying do not have any chance of gaining justice. Those targeted by HN348 may not even know they were spied on by an undercover police officer. The same applies for the majority of those targeted by the 144 known undercover officers. The police and their lawyers need to stop blocking access to justice. And former police officers need to stop clutching at straws to justify why they shouldn’t be named. It is a total insult to those of us who have been the targets of police spying. The author is a core participant in the Undercover Policing Inquiry. – The Undercover Policing Inquiry is currently refusing to fund reasonable expenses for those involved. This means many people are being denied access to justice. Please support our CrowdJustice appeal to cover these costs. The cover names of three police officers who spied on political activists have just been revealed by an inquiry into undercover policing. The three officers infiltrated high-profile campaigns at a time of great public anger. Inquiry documents and secret intelligence reports reveal just how far the state went to undermine opposition to injustices. And understanding the response to that overreach is crucial to understanding what’s happening now. The three undercover officers (UCOs) were assigned with the Special Demonstration Squad (SDS) and were operational from 1968 to 1976. They (cover names) are Rick Gibson [pdf] (deceased), Douglas Edwards [pdf] and John Graham [pdf]. An outline of their undercover activities is given in each document. The three infiltrated a number of political campaigns and organisations, including [pdf] Troops Out Movement, Vietnam Solidarity Campaign and anarchist groups. But the police learned lessons from Grosvenor Square. And ahead of a follow-up demo in October of that year, a Special Branch document provided a list of around 50 ‘leaders’. While another report revealed anticipated numbers of activists; and properties that could be targeted. Such intelligence would undoubtedly be useful to UCOs. This assessment was not far off the truth. For the militancy on the streets was followed by another form of resistance. It is difficult now to imagine the intensity of the times. Edward Heath was locked into a lengthy dispute with workers who occupied the Clydeside shipyards in Glasgow, which would eventually end with a humiliating climb down for the government. Internment was introduced in Northern Ireland and the Bloody Sunday massacre of civil-rights marchers in January 1972 happened while the Angry Brigade suspects were awaiting trial. 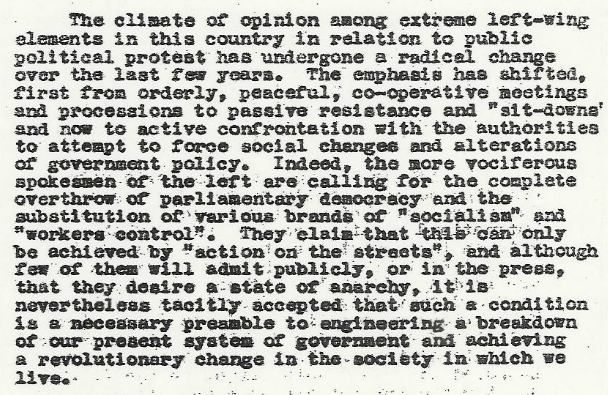 One document found in the raids across London that weekend brought the three causes together in a mini-manifesto: ‘Put the boot in – Bogside, Clydeside – Support the Angry side’. The Angry Brigade was operational for 12 months from August 1970. It’s known that the SDS used around 100 covert identities to infiltrate organisations and provide intelligence between 1968 and 2008. Possible targets of covert policing would have included industrial disputes, such as the Grunwick dispute, the Shewsbury pickets campaign and the 1972, 1974 and 1984/5 miners’ strikes. But all this was just the tip of the iceberg. According to whistleblower Annie Machon, MI5 considered many public figures of the day worthy of surveillance, including John Lennon, Jeremy Corbyn, Mark Thomas, Tony Blair and Harold Wilson. The SDS was not just a child of the 60s and 70s, its work and that of other undercover policing units continued over subsequent decades. And Her Majesty’s Inspectorate of Constabulary subsequently revealed that a massive 3,466 undercover operations took place in England and Wales between 2009 and 2013 alone. The Undercover Policing Inquiry was set up in 2015 to examine some of the practices deployed by these units[is he serious?...ed....he's trying to be!...Ned.]. But it’s taken two years for a small number of cover names of UCOs to be released. The inquiry will reveal more in due course, though as The Canary reported many undercover policing files have gone ‘missing’. [well, there's a surprise...NOT!..ed.]. Citizen activists are demanding real names should be released too. Because many UCOs formed sexual relationships as part of their cover. Indeed, former UCO Andy Coles (his real name) was exposed earlier this year – not by the inquiry, but by independent researchers. And now he is under pressure to resign as councillor with Peterborough City Council. The inquiry has agreed the then young woman he’s alleged to have exploited will be a ‘core participant’ in its investigation. Regardless of the difference in technologies used, there are clear parallels between the political policing of earlier decades and of today. Moreover, public anger about the same injustices is no less palpable. – Check out Undercover Research Group and Campaign Against Police Surveillance. When Alison* told her family that her partner, who had disappeared without a trace after a five year relationship, was actually a police spy, her suspicions were dismissed as those of a spurned spouse. The pair had began their relationship in May 1995 and it wasn’t long until they moved in together. It seemed like the “ideal” relationship, Alison recalls. But one day in 2000, she came home from work to find that Mark had disappeared, leaving only a note. Alison has not seen him since, but she wasn’t alone. 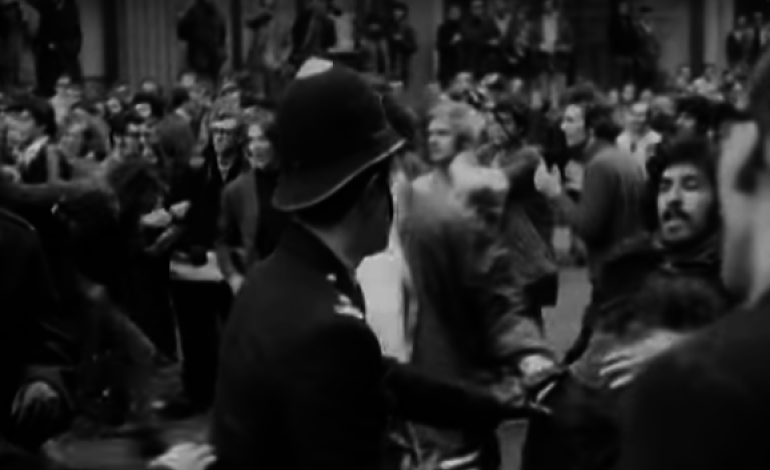 Between 1968 and 2008 Scotland Yard’s Special Demonstration Squad (SDS) deployed undercover officers to infiltrate hundreds of political groups. In an information gathering exercise, male police officers struck up relationships with female activists, often lasting years and sometimes even resulting in children. These officers told lies, created completely fictitious personalities and seduced scores of female activists into affairs in a bid to infiltrate groups fighting for environmental, political and social justice causes. But it wasn’t until 2014 that the true extent of the Met’s undercover policing operations began to come to light after it was revealed that officers had been sent to spy on the bereaved family of Stephen Lawrence. Doreen Lawrence, the mother of the murdered teenager, joined the chorus of activists calling for undercover officers to be identified. Following Mark Ellison’s review, which looked at the role of undercover policing in the Lawrence case, the then-Home Secretary Theresa May launched the Undercover Policing Inquiry. On Wednesday, the Undercover Policing Inquiry will hold a hearing to determine whether to give the Met a time extension to submit anonymity applications for officers formerly employed by the SDS. Campaign groupPolice Spies Out of Lives was set up to support legal action brought by eight women tricked into long term relationships with undercover police officers. Activists have accused the police of “delaying tactics”, but the Met says it is “responding in line with its (the inquiry’s) timescales”. The launch of the inquiry helped to bring women’s stories out of the shadows and the Met has admitted that the long-term sexual relationships instigated by officers with activists were “abusive, deceitful, manipulative and wrong”. In an apology issued in November 2015, Met Assistant Commissioner Martin Hewitt said the relationships “should never have happened” and admitted they “were a gross violation of personal dignity and integrity”. Yet there are still many women waiting for answers. Doreen Lawrence, the mother of murdered teenager Stephen Lawrence, talks to the media, with her son Stuart (right) and Imran Khan (left) from her legal team outside New Scotland Yard, central London, following a meeting with Metropolitan Police Commissioner Sir Bernard Hogan-Howe, to discuss claims that undercover police officers hunted for information to smear her family. “I would like the police to be there to protect people, I’m not surprised that police take an active interest in the politics of dissent but I don’t think anybody… thought that there was this level of infiltration – and infiltration on such a personal and intrusive and abusive level,” Alison, whose true identity has been protected, tells The Huffington Post UK. The cover names of the officers involved in undercover policing from 1968 onwards to be released. The names of the groups that were spied on. The files of all the people spied on handed over to the people. A finding of institutionalised sexism in the police. An awareness amongst the political class and society at large of the scale of surveillance of political dissent in the UK. Mark told Alison he was a joiner from Birkenhead. He said that he was estranged from his mother and that his father had passed away when he was a child. The only family he said he had living in the UK was his grandfather. “A lot of the police spies, we have now found out, had painful and heartbreaking backstories,” Alison says. It was only after he left that she became suspicious that he might not have been who she thought. Alison with undercover police officer Mark Jenner, whom she knew as Mark Cassidy. It was only after a conversation with another activist soon after Mark’s sudden disappearance that Alison began to suspect he was a spy. “It’s nutty but suddenly it made sense,” Alison says. It would take another 11 years before her suspicions would be confirmed. Many would find it hard to understand why a police officer would strike up a relationship with someone just for being an activist. But Alison’s story is one of many and she still does not know why the police thought it necessary to infiltrate her life so deeply. “Every target of this kind of abuse so far has been women,” Alison says. “We know of one female undercover officer who had a one night stand with somebody but all of these cases of long term relationships are male officers with female activists. Another woman who was targeted by the police in strikingly similar circumstances was Helen Steel. Helen was just 22 when she met John Baker while volunteering with London Greenpeace in the late 1980s. Unbeknown to her, the man she met was actually undercover police officer John Dines. During the time they were together Helen was involved in the McLibel case. McDonald’s filed a libel lawsuit against her and fellow environmental activist David Morris over a leaflet that was critical of the company. Helen says that one of the authors of the McLibel factsheet was an undercover police officer. The drawn-out litigation, which lasted 10 years, made it the longest-running cases in English history and it was the subject of a Ken Loach documentary. Helen Steel (L) and David Morris stand outside McDonald’s restaurant in central London following the McLibel court case. Helen and John were in a relationship for about two years until he abruptly disappeared one day, only leaving a letter saying he could not cope any longer. It wasn’t until years later that she found out John had been working for a secretive police unit and had been lying to her the whole time. The pattern in each woman’s case was the same. “It was only when we came together and discussed our common experiences that we realised a lot of the similar patterns of what was going on,” Helen tells HuffPost UK. The experience left lasting emotional scars for many of the women who were targeted. Not only do they have to come to terms with the fact that their relationships were a lie, but it also led to a warped expectation of what a relationship should be. “They all seemed like the ideal man. They were always supportive and charming and helpful… it’s always important to get on because if you don’t get on with people you don’t get information out of them,” Helen says. By forming a relationship with these women the undercover police officers gained credibility within the group they were trying to infiltrate. Met Assistant Commissioner Martin Hewitt admitted in 2015 that the undercover police relationships ‘should never have happened’. The experience also had an impact on the women’s relationships with their own families. After Mark disappeared Alison started researching the security services, including MI5, in an attempt to uncover more details about this “spy” who had fooled her for so many years. “I didn’t know what he was but I was convinced that he was (a spy) and with very few exceptions everybody thought I was mad,” she says. “I was not well. I was up all night, I was logging cars outside my house, I was spotting people on the bus who I thought were following me, I thought my phone was tapped, I thought my emails were being monitored. One of the most harrowing parts of these women’s experiences is that the deception was sanctioned by the state. Alison says that all the male officers in the SDS had to be married so they would “have something to come back to”. Unknown to Alison, Mark had a wife and children the whole time they were in a relationship. John was also married. “So not only did the managers and hierarchy in the police know about the operations, not only were they sanctioning the abuse of the female activists who were being infiltrated but they were also sanctioning adultery… The wives of these officers are as much victims of this whole experience as the female activists,” Alison says. Alison says that she feels she was a “perk of the job” for Mark and suspects that many of the male police officers saw the relationships they were having with female activists in a similar light. Both Alison and Helen are now 51 and say they are trying to move on with their lives, but with so many unanswered questions, this has proved difficult. One of the many things activists still do not know is why they were targeted in the first place and they hope the inquiry will help to answer many of these questions, but the Met has been criticised for delaying the process. Sir Christopher Pitchford, chairman to the Undercover Policing Inquiry. A Met Police spokesman said in a statement to HuffPost UK: “The MPS wishes to assist the Inquiry to fulfil its terms of reference and is responding in line with its timescales and also providing information, including extensive disclosure voluntarily. “The task is unprecedented given the many thousands of documents and decades of operational activity that the Inquiry is considering. We have a significant team of officers and lawyers who are working hard to provide our fullest possible support. Despite not knowing why they were targeted, both women agree that such deception is never acceptable. “The reason why there are no circumstances in which it’s ok is because that’s why we’ve got a criminal justice system. If somebody is suspected of doing something you collect the evidence, you charge them and then you prosecute them and then they go through the system. No-one was charged with anything. It was just information gathering,” Alison says. But there is one unexpected result to have come from the experience. Helen says: “Without meaning to, through what we have all exposed, they have thrown together some of the most able and some of the most powerful activists in the country coming from completely different angles… this group of people, who were not necessarily working together on stuff, were suddenly in the same room, which is probably their worst nightmare. *Alison is a pseudonym to protect her identity. More than 900 serving police officers and community support officers have a criminal record, official figures show. Forces across England and Wales employ policemen and women with convictions including burglary, causing death by careless driving, robbery, supplying drugs, domestic violence, forgery and perverting the course of justice. Those with criminal records include senior officers, among them two detective chief inspectors and one chief inspector working for the Metropolitan Police. At least 944 currently serving officers and police community support officers (PCSOs) have a conviction, according to figures released by 33 of the 43 forces in England and Wales in response to Freedom of Information requests. Many forces could not provide details of criminal records dating from before their staff joined the police,meaning the true figure will be significantly higher. The Metropolitan Police, Britain's largest force, came top with 356 officers and 41 PCSOs with convictions. It was followed by Kent Police (49), Devon and Cornwall Police (44), Essex Police (42), South Yorkshire Police (35), Hampshire Police (31) and West Midlands Police (27), although not all the figures are directly comparable. Devon and Cornwall Police - a Pc convicted of burglary as a teenager. Essex Police - one inspector convicted of dangerous driving; another inspector convicted of possessing and supplying cannabis; a detective constable convicted of robbery; a Pc convicted of data protection breaches for viewing intelligence records relating to friends [and how many cops have done this? I know for a fact conversations have taken place between my GP and police re: my being prescribed painkillers / etc....], relatives or other people living in the local area, and aspecial constable convicted of stealing a set of car number plates, putting them on another vehicle and obtaining petrol without paying. Hertfordshire Police - a sergeant convicted of dangerous driving. Kent Police - a Pc convicted of perverting the course of justice in 1998. Merseyside Police - five officers convicted of assault and one convicted of causing death by careless driving. Norfolk Police - a Pc convicted of causing death by careless driving. North Wales Police - an officer convicted of forgery. Staffordshire Police - an inspector convicted of assault causing actual bodily harm and a Pc convicted of keeping a dangerous dog. Surrey Police - a detective constable convicted of obstructing police officers; a Pc convicted of wounding; a Pc convicted of drink driving in 1988 and resisting arrest a decade later, and a Pc convicted of animal suffering in 2006. Home Office guidelines issued in 2003 say police officers should have ''proven integrity'' because they are vulnerable to pressure from criminals to reveal information. The guidance says forces should reject potential recruits with convictions for serious offences - including causing actual bodily harm, burglary, dangerous driving and supplying drugs - unless there are ''exceptionally compelling circumstances''.